To report the presence of the emerald ash borer, please contact your municipality. Some of the towns with many public trees have taken the initiative to implement measures that have allowed them to address the issue of the emerald ash borer’s imminent arrival. The town of Bromont, Lac-Brome, Farnham and Cowansville will notably by doing an inventory of their public ash trees. As a result, they will be able to plan for the actions that are required and to estimate the costs related to the problems caused by this insect. Also in 2016, the action plan calls for the holding of information meetings with citizens, in both French and English, informing them about the arrival of this ravaging insect and what is being envisioned in terms of combating the problem. With the aim of heightening the detection of infestation sites and in an effort to establish targeted actions, traps will be installed and detection by the sampling of branches will be conducted. 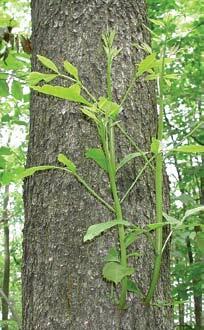 There are several species of ash trees in southern region of Quebec . 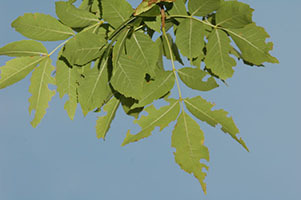 There is white ash (Fraxinus americana), black ash (Fraxinus nigra) and green ash (Fraxinus pennsylvanica). This species are very acclimated to the urban environment and have been extensively used by cities for twenty years. The green one also left room for several varieties which are looking the same with slight morphological differences. The emerald ash borer is an insect that comes from Asia for which no natural predator has yet to be found on the North American continent. Since it causes a tree to die in a very short period of time (3-5 years), the impact of this insect is similar to that of Dutch elm disease where most ash trees will disappear from the municipal landscape in the mid-term. The problem is that the ash tree has been used for many years as an urban tree, because it is well acclimated to these conditions. 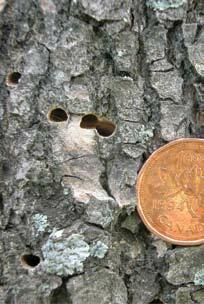 It is estimated that in some neighbourhoods, the ash tree accounts for more than 50% of the tree population. The speed at which the insect kills its host will reduce the vegetal covering accordingly in a short while. The objective of developing an effective strategy to attack the problem is to reduce the rate of the disappearance of ash trees in an effort to progressively replace them and lower the visual, social and ecological impact of this decline. In the forest environment, the ash tree is an essence companion surrounded by many other species. It rarely forms homogenous stands. This makes it less of an attraction to the emerald ash borer. Moreover, the loss of a few ash trees does not lead to the complete loss of covering, apart from the reducing of the canopy density. For the moment, the watchword pertaining to the forest environment is to be patient in order to keep as many ash trees as possible alive. This mass protection may one day result in the emergence of single stands that will be able to better respond to this ravaging insect. Click here for more information. In recent years, foresters have noticed a decline among the ash tree population. This decline appears to be quite generalized in the Montérégie region, although there is no specific reason to explain this. This decline might lead some people to believe that ash trees are about to die because of the emerald ash borer, but be careful this may not be the case! Check for the appearance of other signs and symptoms before jumping to a conclusion. 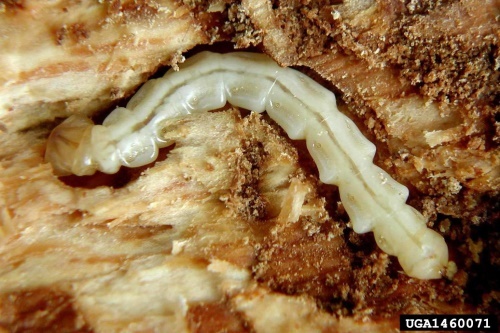 The government organization in charge of the regulatory control of the spread of the emerald ash borer is the Canadian Food Inspection Agency (CFIA). It imposes restrictions by prohibiting the movement of the insect and contaminated material emanating from the ash borer out of a regulated area. This area was expanded in 2015 to extend to the Eastern boundary of the MRC’s territory. *Movement of material is permitted provided authorization to this effect has been obtained from the CFIA. 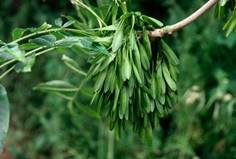 It is recommended to carry ash trees and branches between October 15 and March 15 to reduce spreading of adult EAB. 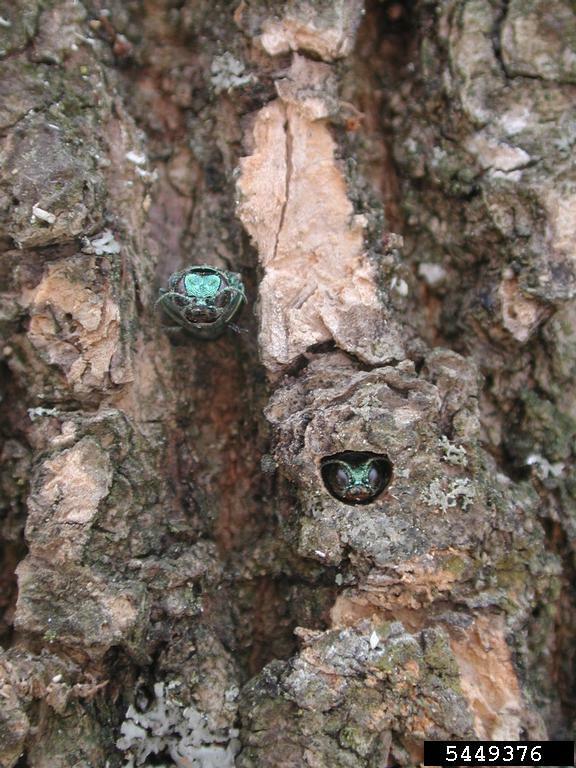 The emerald ash borer, which is native to Asia, was detected in Michigan and in Ontario for the first time in 2002, and the insect had apparently been in this area for about 15 years before it was discovered. Since then, the emerald ash borer population has constantly been on the rise. The insect made its way to Montreal in 2011, Carignan in 2008, Granby in 2013 and then to Bromont in 2015. The insect is an emerald-green-underside beetle that feeds on the leaves of ash trees at an adult age and the underbark of the tree at the larval stage. In this latter phase, the insect feeds beneath the bark, out of sight, and notches very distinctive S-shaped larval galleries. It is the proliferation of these galleries that eventually kills the tree. There are two types of ways the insect spreads. 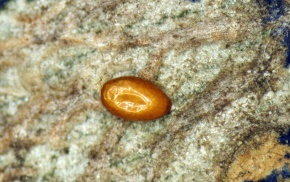 The first, which occurs over relatively short distances, is done by the adult insect itself by locating and mating with another insect. The second method of conveyance is human-made and it consists of the movement of contaminated material. The transporting of firewood is regarded as one of the most common ways the insect spreads. The solution: Buy local and avoid transporting your campfire wood! 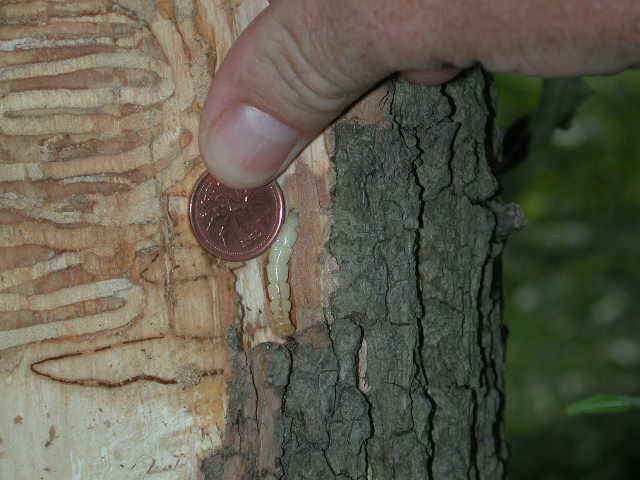 Trees that are affected by the emerald ash borer may take a few years before the signs and symptoms start to appear. The first signs are the leafy parts of the tree that have been chewed by the adult insect, giving the leaves a notched appearance. Then, thinning of the crown appears, followed by an increase of signs of chewing on the trunk or lower in the scaffold branches. The ravaging continues toward the bottom of the crown and the tree ends up dying. In the last stages, woodpecker notches appear and D-shaped exit holes typical of the insect emerge. At this time, the tree is already infested. Trous de sortie en forme de "D"
For the moment, citizens are being asked to use the ecocentres (from April to the end of November) on the territory of the MRC Brome-Missisquoi. Citizens must notify the municipal employees when they bring their ash trees to the ecocentres so that they will be able to identify the eventual sites of emerald ash borer outbreaks of infestation. 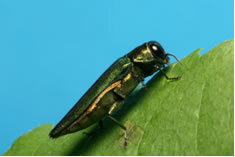 It is recommended to carry ash trees and branches between October 15 and March 15 to reduce spreading of adult EAB. What should I do with the wood debris once I have cut down my ash tree? You need to reduce the movement of contaminated material as much as possible. 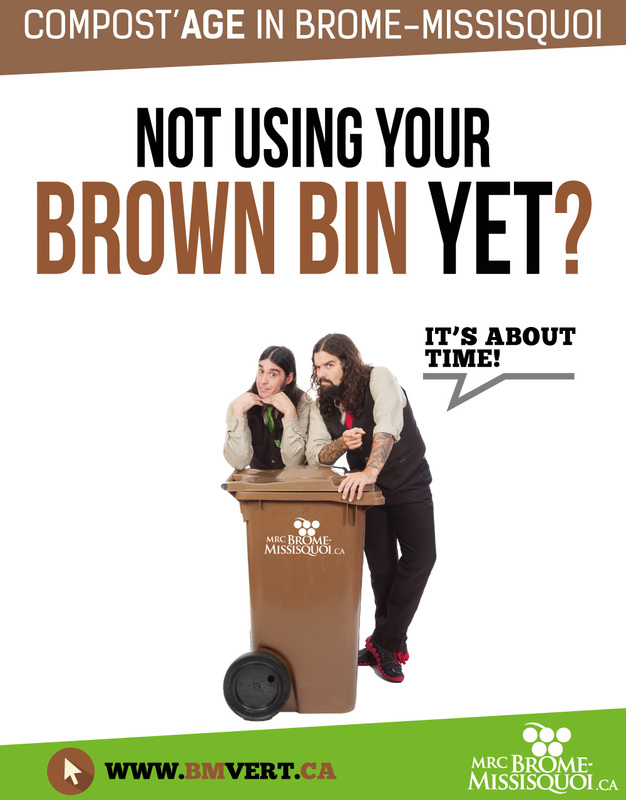 You can burn or shred the branches on site (check with your municipality beforehand to find out if this can be done). If this cannot be done, the eco-centres will take the branches. But please be sure that you properly cover your trailer in order to reduce the spread of the insect. 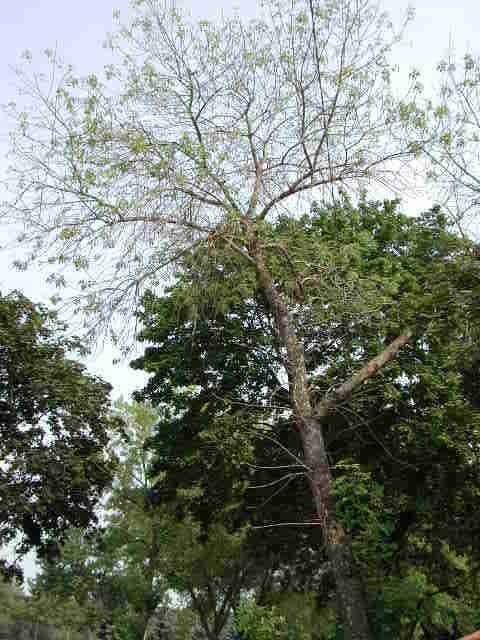 What should I do if I suspect my ash tree is affected by the emerald ash borer? Since Brome-Missisquoi is entirely in the regulated zone, reporting a discovery of the presence of the emerald ash borer to the Canadian Food Inspection Agency is no longer mandatory. What tree could I use as a replacement for the ash tree I cut down? 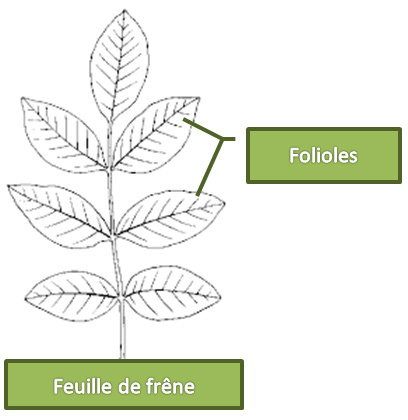 Check the list of replacement trees from Hydro-Québec or the list from the MRC (in French only). Can I participate in the municipal efforts? Vous pouvez indiquer la présence d’un frêne suspect ou informer que vous avez fait abattre un frêne atteint d’agrile en contactant votre municipalité. Il n’y pas actuellement de suivi systématique auprès des citoyens, mais la transmission de cas d’agrile permet de suivre l’évolution de la progression de l’insecte sur le territoire et éventuellement de prévoir des actions adaptées en fonction des réalités municipales. How can I be sure that the contractor properly disposes of the ash tree? A contractor member of the Société internationale d’arboriculture du Québec (SIAQ) is a model of professionalism. You can ask the professional that you consult how he or she will be disposing of the remains of your cut trees. 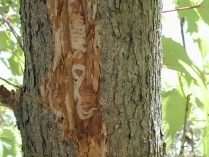 Ask the professional how you can detect the signs or symptoms of the presence of the emerald ash borer on a tree. Should I urge into cutting down all of the ash trees in my wooded area before the arrival of the emerald ash borer? 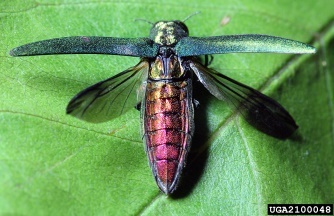 No, for the moment, the watchword is to monitor the ash trees in your wooded areas to see where they have been affected by the emerald ash borer. If they have been affected, the properties of the wood will remain in good condition for a few years after infestation, which gives you enough time to react to the problem. Please see the following document for more information. If I am a citizen of the MRC, can I bring my ash wood debris to the ecocentres (from April to the end of November)? Yes, movement of the material outside the regulated zone is prohibited, but Brome-Missisquoi is entirely in this zone. Appropriate measures will have to be undertaken so that the emerald ash borer does not spread during the transporting of your branches (cover your trailer with a canvas tarp or shred your branches before transporting them).